a common fault in putting. There is no need to move about when putting. The more you hold still, the easier it will be to make solid contact with the ball. Only your Putting Triangle should move during your stroke. The more you move about during your stroke, the more you will reduce your chances of holing the putt. Another analogy that putting instructors use, is for you to imagine that your lower body is set in a barrel of concrete. On the Tour a number of professionals quieten their lower body by widening their stance. This has the effect of stabilising their centre of gravity. Putting is contrary to all other aspects of how the game is played. The grip, the stance, the swing, the position of the head and arms, the use of the wrists - all demand a different approach. In reality this means that learning to drive or play an iron shot does nothing to prepare you for putting. The last thing you want during your putting stroke is transfer your weight. 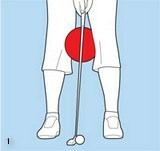 Putting is a simple activity. So childishly simple is its appearance, few golfers ever consider a putting lesson. Through omission they never learn that an important fundamental of consistent putting is to quieten their body and their mind. Studies have shown that the best performances where accuracy is required occur when the heart rate decelerates. The biathlon combines the two disciplines of cross country skiing and rifle shooting. Competitors must learn through rigorous training the ability to control their heart rate. Unless they can slow down their heart rate before shooting, their shots are unlikely to find their targets. In the same way you cannot expect to putt consistently with a racing heart and an over-active mind. Any unwanted body motion during your stroke will lead directly to a breakdown in your distance control and a lack of accuracy. The most obvious movement in putting is when you prematurely look up to observe the outcome of your putt. The act of turning towards the hole draws back your left shoulder and changes the angle of your putterface at impact. Remember the old African American spiritual 'Dem Bones.' The song recalls how everything in our anatomy is connected. What this means is that moving one part of your body will also cause another part of your body to move. If you move your lower body or head during your putting stroke, your body motion will more than likely change the outcome of your putt. At best, a wrong read and a poor stroke may cancel each other out with your putt finding the hole by default.